Rigid foam insulation is used throughout the home, but most often in basement walls. If you are a do-it-yourself homeowner finishing your basement, this likely will be your encounter with closed-cell rigid foam. But can you run rigid foam between the studs, just like you would with fiberglass rolls or spray foam? While not the officially recommended method, installation of rigid foam between studs in below-grade areas can have some benefits. 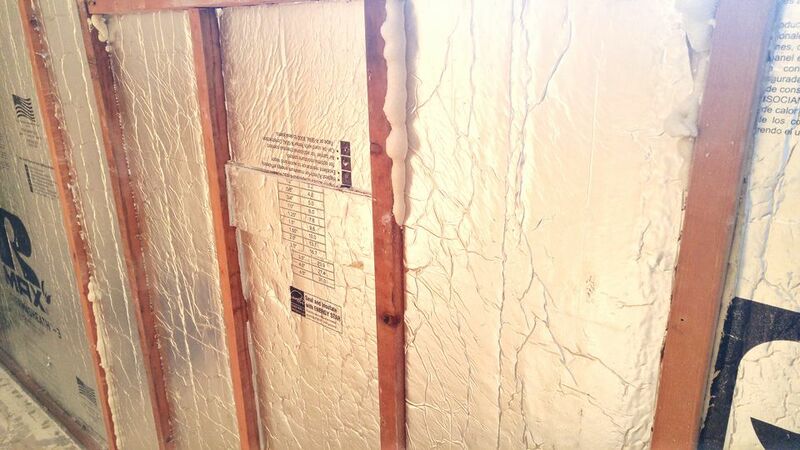 Rigid foam belongs below-grade; rarely will you install fiberglass insulation below grade. One exception might be if you are insulating a heated finished basement space against another interior basement space that is unheated. Because you expect this interior wall to stay dry, you can use fiberglass. Another exception is with "daylight walls" in otherwise below-grade basements. Large: Available in up to 4' x 8' sheets to help you rapidly cover expansive walls. Manageable 2' x 8' and 4' x 4' sheets can be purchased, too. Water-Resistant: Impervious to water, which means that it is better at mitigating mold than fiberglass insulation. Low R-Value: Low to moderate R-value per dollar, compared to fiberglass. Per square foot of R-value, it costs about twice as much as fiberglass. Rigid foam is meant to be continuous. By contrast, the classic wall system of studs placed every 16 inches on-center does not provide for continuous insulation. As exterior sheathing, rigid foam is installed on the outside of the house, just under the siding. The foam sheets are butted next to each other and taped to prevent air infiltration. On basement walls, continuity is important, too. With sheets tightly placed end-to-end, there is no chance of a thermal bridge. A thermal bridge is any avenue that unwanted temperatures, hot or cold, are given to come into your home. It can be as obvious as a crack or hole in the wall. Surprisingly, it can also be a solid material that has high thermal conductivity. Metal easily transfers cold. If you have any kind of unbroken metal that runs from the exterior to the interior, you have a thermal bridge. Wood can also be a thermal bridge, though not as great as metal. Thus, wood wall studs can act as a passageway for cold to transfer into your home's interior. Martin Holladay at Green Building Advisor makes a strong case for not installing foam between studs. He mentions the increased work of cutting multiple pieces of rigid foam--to exacting dimensions--to fit in the bays. Besides the issue of unbroken thermal bridges, he also mentions that wood studs expand and contract--providing more opportunities for cracks to develop. Rigid Foam or No Insulation? If it is a choice between no insulation and piecemeal rigid foam, the foam wins out. Wall System Already In Place: You may have a well-established wall system. Dismantling it is not worthwhile. Professional Foam Too Much: Spray foam installed by a company costs too much or is unavailable in your area. Lower Insulation Needs: Your insulation needs are not substantial. With earth banked up behind your concrete walls, temperatures are moderated. The issue of thermal breaks is minimal. Measure Project Area: Measure the entire wall area (i.e., 30 feet wide, 7 feet high) to figure out amount of rigid foam to purchase. Do not subtract studs. Measure Individual Cavities: Measure each bay individually. Studs placed every 16" OC will have approximately 14" of bay width. While you want the foam to be tight, you do not want it to be oversized, as it is difficult to shave down the foam. Mark and Cut: Mark dimensions with a Sharpie on the foam with a drywall T. Cut with an ordinary wood saw. Install: Place foam in bay. If it is not fitting well, try turning it around backwards--either side will work. Seal Gaps: Gaps between the foam and studs should be sealed with low-expanding spray foam sealant. Any insulation is usually better than no insulation, as long as that insulation does not create more problems for you later on. Insulating with fiberglass against a vapor-ridden concrete wall is an example of the latter. If you can just as easily install continuous rigid foam against concrete, that should be your first choice.